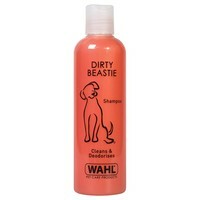 Wahl Dirty Beastie Shampoo is a perfectly balanced formula that will effectively cleanse dirty, thick or matted coats and deodorise even the smelliest coat. Based on natural ingredients including extracts of peach, pear, passion flower and kiwi fruit, Wahl Dirty Beastie has been designed to be powerful yet gentle, actively removing dirt, grease, stains and odours. Designed to rejuvenate the hair as it cleans, the shampoo also contains beneficial ingredients that will promote healthy, glossy results every time. Please Note: The 250ml size is already diluted and ready to use, while the 500ml is a concentrated formula that will need diluting.